► We are very pleased to announce that we are now authorized retailers of the amazing PYM II; otherwise known as Preserve Your Memories 2! PYM II was invented by a Vietnam Veteran, is made right here in the USA and is an amazing product; it's a Win-Win-Win!! ►PLEASE NOTE: PYM II must be shipped via ground service only. Price includes shipping. Please purchase this item separately from any other items you wish to purchase. Can ONLY be shipped within the Continental USA. 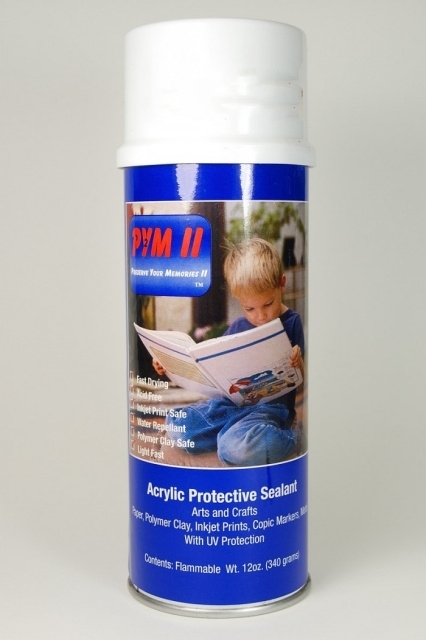 Preserve Your Memories II is spray on sealant to protect a variety of items. It is acid-free, fast drying and water repellent. PYM-II protects like a laminate. It's also non-yellowing and blocks UV rays. It will take on the texture of the material you are coating. It's VOC exempt thus environmentally friendly. This one product can be used on a huge variety of items. In jewelry work you can seal in and protect metal patinas and alcohol inks, metal and polymer clays, and more. Before coating, make sure your items are clean and dry. Lay the item to be coated on newspaper or paper towels. Hold the can of PYM-II at a 45deg angle about 4-6" from the item. Spray from the outside with a smooth, sweeping motion across the piece until a thin, even coat has been applied. Avoid starting or stopping the spray on the object. The coating will dry in 2-3 minutes. PYM-II is flammable and for adult use only. Sold in a 12oz can. It will coat an area approximately the size of 60, 8-1/2" x 11" sheets. Premium polishing kit with stand, 24 piece set for rotary tools/flexshafts Pro-Poilsh Polishing Pads (set of 3) polishing cloth metal polishing metal cleaning copper polish brass polish aluminum polish Rotary tool accessory kit, 30 pieces!